As its name suggests, Lingshui is an autonomously administered County of the Li Ethnic Minority on Hainan Island. The Li are a separate ethnic Nationality which is in essence unique to Hainan Island and relatively few parts of mainland China. The Li (黎; pinyin: Lí) People call themselves Hlai. The Li are believed to be descendants of the ancient Yue tribes who lived in what today are parts of Guangxi Zhuang Autonomous Region and Guangdong Province and Hainan Island of China and in (north) Vietnam. It is said that these peoples had settled Hainan and other islands already thousands of years ago, by now having developed into the Li People. DNA analysis carried out amongst the modern Li population indicate a close relationship with populations in the southern Chinese province of Guangxi which translates into the fact that they are actually originally Vietnamese peoples. These people have become part of the Chinese Realm after subsequent historic Chinese invasions of Vietnam and subsequently absorption of territories now recognized as Hainan Island (Province), and parts of Guangdong Province and Guangxi Zhuang Autonomous Region. The first historic documents dealing with the Li date back to the Sui Dynasty (581-618 AD) at which time the first administrative units were divized for the island and there is mention of the Li, which were identified by the name Liliao (People). Today, much later on, the Li form one of the 56 ethnic groups (previously named Nationalities) officially recognized by the People's Republic of China. During the Japanese occupation of Hainan (1939–1945), the Li suffered heavily. Subsequently, under the policies of the Peoples Republic of China the Li People faired reasonably well. Although everyone suffered from communist policies aimed at eradicating old superstitions and according cultures, the Li, who had wisely chosen the side of the Communist partisans in the Chinese Civil War (1946-1949) were rewarded in the new Peoples Republic with their very own Li Ethnic Minority Autonomous Prefecture (much alike the Koreans up north in Yanbian Korean Autonomous Prefecture.). Currently, they are officially still held in high esteem by the Beijing government because they fought on the side of the CPC against Chinese Nationalist rule during the Chinese Civil War. However, in reality the Li are being assimilated their culture overrun by tourist, migrants and real estate development. Hainan Li-Miao Autonomous Prefecture was created in 1952 and was abolished in 1988, today leaving scattered Li Autonomous Counties with a much diminished administrative status and thus political influence. The vast majority of these peoples live along the southern coast and in the southern counties on Hainan Island and also along the southern coast of mainland China. Due to the previous remoteness of Hainan Island, up to fairly recently the Li communities on Hainan Island were considered unique to to their local preservation of specific primitive tribal cultures. On Hainan Island, especially in the south they are considered the largest minority ethnic group, next to the Miao and a number of other groups who count far fewer in numbers. The Li People are generally divided into the five branches of the Qi, Ha, Run, Sai and Meifu. The Li speak their own Hlai language, a member of the Tai–Kadai language family, but most -especially the young- can understand or speak Hainanese and Mandarin. The Li have their own distinctive culture and customs the exact nature of which is however rarely quoted. 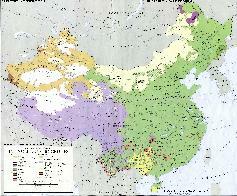 For more information on the Li People (Hlai), please refer to ethnic minorities in Hainan Province. Surface Area: 1128 square kilometres (-- square miles). Learn about what is new on this Site from below window. For a Full Review of the landmarks and Monuments of Lingshui Town and Lingshui Li Autonomous County, please refer to the full page via below button. Lingshui has a railroad station of the Eastern Ring Railway but there is no airport. The local airfield is Lingshui Military Airbase (PLAN). Nearest Airport is at Sanya. Lingshui has no airport of its own, but there is a military airfield situated due east of Lingshui town. The nearest Airport is Sanya Phoenix International Airport which offers a multitude of air connections. Lingshui Town is directly connected to Sanya Phoenix Airport by means of the Hainan Eastern-Ring High-Speed Railway which travels between Lingshui Train Station, Yalong Bay, Sanya Station and Sanya Phoenix Airport Station which is the current end of the line in the south of Hainan Island. For more information on Sanya Phoenix International Airport, please refer to dedicated page via below button. According to mainstream Chinese narratives about the history of Hainan Lingshui as a location is first mentioned in documents relating to the year 611 AD of the Sui Dynasty (581 AD - 618 AD) in which there is mention of a home county, and town governance to the south of the Zaytun (River or Harbor). Historically two arguments are given for the origins of the name Lingshui and County. The strongest of these again is based on ancient books which mention a Nan water on Hainan Island which was referred to as "the Lingshui," and so associating the "county" (Lingshui County Area) of that time with water. This water today is the Lingshui River and indeed there are stil large inland lakes in the lower lying eastern parts of the County. Subsequently, during the succeeeding Tang Dynasty Era (618 AD - 907 AD) the history of Lingshui County continues in official documents with a mention of "the established rule in Boji village, that originate in/is based on seven Ling-Ling gate water (ie.e the Lingshui River) which flows through the county". "Ling gate water" thus treanslates as "Lingshui River" and after establishment of Tang Dynasty centralized rule over its central town it was henceforth known in history as Lingshui, at least according to officially approved Chinese historical narrative. In 1952, in part as a token of gratitude to the Li People who had worked together with local Chinese Communist groups throughout the period of Japanese Occupation of the Island, the Hainan Li and Miao Autonomous Prefecture was established on Hainan Island, making the Island a de facto Autonomously Administered part of Guangdong Province. Lingshui Military Airbase and adjoining highly secret Signals Intelligence Base were established in the year 1968. Hainan Island was established as a Province in the year 1984. Subsequently, on November 20, 1987, the State Council approved the revocation of Lingshui County replacing it with the establishment of Li Autonomous County of Lingshui, on December 31 formally established as the Lingshui Li Autonomous County. Subsequently, in the year 1988 the Hainan (Island) Li and Miao Autonomous Prefecture status was revoked ending more than 3 decades of Li Autonomous rule with the great Chinese Peoples Republic. With a much lower political status and great loss of power within the system of National Politics the Li People subsequently had to watch how their still relatively pristine and agricultural island was turned over to the powerful politically connected real estate developers of the mainland who were free to develop Hainan Island into the number one National luxury tourism mecca that its has come to be. In 2001 Lingshui County reached the International Headlines around the world when a U.S. electronic surveilance aircraft made a forced landing at the local Lingshui Airbase of the Chinese Air Force. The ensuing episodes and international diplomatic incident are today known as the "Hainan Island Incident". The renowned "monkey island" of Lingshui county was created in the year 1965. Although it is said to be an Island, the monkey island is better understood as the Nanwan Provincial Nature Reserve, a part of a Hilly Peninsula found along Lingshui Bay on the opposite side of Xincun Fishing Port and the Pearl Farm(s). The nature reserve spanning some 1000 hectares is home to about 2000 macaques and is still a popular destination. Today visitors can travel there from Xincun Port by means of a cable way which stretches across the natural harbor to connect with the Nanwan Peninsula directly. In 2002 the town of Yelin was formed from local villages. Today it forms the central town and district of Lingshui Li Autonomous County. In 2013 the Lingshui Li'An Harbor Ocean Theme Park opened outside and west of Lingshui County Town. Following upon the above general outline on Lingshui Li Autonomous County, neither town or county are today what they were in the fairly recent past. Lingshui is no longer that kozy ethnic minority town situated well away from the big tourist magnet of Sanya and all its development, tourist buzz and exploitations. Now easily connected to the city by both a multilane highway (--) and the Hainan East-Ring High-Speed Railway, Lingshui is joining as one of the many resort towns and destinations on Hainan Island. In fact, it is considered a new and hot destination within Hainan Island Province with its clear blue waters and developing resorts drawing in an enthusiastic international crowd. Where the original towns inhabitants were still in the far majority ethnic Li, today the town of Lingshui has expanded swollen with new citizens, often arrived from the mainland or those passing through as mere tourists. In addition to the enlargement of the original Lingshui Town which turned it into Yelin District, in the most recent years the entire coastline along Lingshui Bay, once a remote rural stretch with as its best scenery pristine empty beaches and the many local fishermen at work, has been developed, destroyed in fact to make way for several sprawling luxury hotel resorts including the obligatory golf courses. Our pages on Lingshui Town and County do not contain Hotel Reviews. For an overview of Hotels & Resorts to book in Lingshui Li Autonomous County, there are two available options. For a Complete Overview of available Hotels & Resorts on all of Hainan Island, please click through and refer to "Hotel Booking on Hainan Island". For an overview of Hotels specifically in Lingshui County, please refer to below button for information on the nearest available Hotels. Basic information by Hotel, includes map of the area and overview of Hotel locations within that area. There is no specific information available on Climate and weather in Lingshui County. For best information, please refer to main page on Hainan Island, section: "climate and weather on Hainan Island". Click Map to go to Full Version ! The one airfield at Lingshui Town is a military airbase known as Lingshui Airbase. Lingshui Airbase is currently part an airbase of the Peoples Liberation Army Navy (PLAN) and is under the authority of the Guangzhou Military Command, one of the main military districts in the Peoples Republic of China. Apparently the base is the home of the 22nd Wing of the 8th Division of the Peoples Liberation Army Navy Airforce which serves the South China Sea Fleet of the Chinese (PRC) Navy Lingshui Airbase is one of the seven bases of the South China Sea Fleet the others being: Haikou, Sanya, Foluo, Guiping, Jialaishi and Lingling. Lingshui Airbase sits at just 44 kilometers distance to Yulin Harbor (Sanya) which is the main Naval Harbor for the Chinese (PRC) Navy (PLAN). Yulin Harbor also includes a separate submarine harbor which supposedly is home to a part of China's nuclear submarine fleet. The distance to Woody Island (Yongxing Dao) "Airport" aka Military Airfield in the Paracel Island in the South China Sea (--) disputed by Vietnam is only 310 kilometers. Lingshui Airbase was established in 1968. Today Lingshui Airbase still has a single runway. The surrounding facilities of the Airbase both east and west of the runway have recently been expanded.considerably. In addition to the airbase is an electronic listening post or signals intelligence spy post is attached to the base. According to US Intelligence sources this base is located west of the Lingshui Airfield. Reportedly one of the most sensitive military intelligence bases in China it is highly protected and supposedly the base which China (PRC) uses to tap into foreign satellites and other digital electronic traffic. The base supposedly has more than a 1000 staff of the 3rd technical department of the Central Chinese Military Command working on the vital intelligence tasks. Again reportedly, the base is able to intercept and decrypt all satellite communications in the region between western Europe and the Coastline of the United States of America, as well as all locations in Asia and South Asia. For more information on Lingshui Military Airbase (PLANAF), please click through to dedicated page via below button. Airport : No Airport at Lingshui. There are no maps specific to Lingshui Li Autonomous County available at this Time. For most complete listing of available maps on Hainan Island, please refer to Hainan Island Maps Index via below button. A Full Google Earth Supported Map of Lingshui Li Autonomous County. As according to the general system of administrative name giving in the PRC, Lingshui is the center of Lingshui Li Autonomous County which in turn is one of the 6 Autonomous Counties found as a part of Hainan Island Province of China (P.R.C.) (See adjacent map). With the Li People historically residing in the central and southern parts of the Island, Lingshui Li Autonomous County can be found in the south-east of the Island, where the county occupies a stretch along the east coast of the Island. Lingshui County is situated north-east of the 2nd most important city on the Island, Sanya, which sits on the southern tip of Hainan Island where no less than 3 large bays offer a natural harbor and gleeming white tropical sandy beaches. 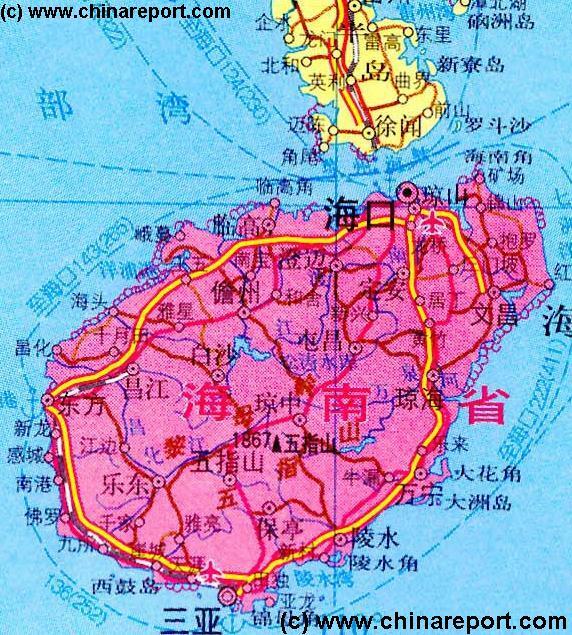 Clockwise around, in the west Lingshui County is bordered by Baoting Li and Miao Autonomous County which lies more towards in center of the island. In the north Lingshui County is bordered by Qiongzhong Li and Miao Autonomous County, to the north-east also occupying a part of the islands east coast lies Wanning County(-Level City), to the east lies the South China Sea (which is a part of the larger Pacific Ocean). Last but not least, to the south-west lies the before mentioned Sanya City Prefecture which is a large city popularly quite renowned as the number tropical resort paradise getaway for mainland Chinese people. Basic knowledge for everyone who would like to go and explore Lingshui County is that the central town of Lingshui is situated along a wide river, the Lingshui River which gives its name to both town and county. The Lingshui River flows from the direction of the Nuiling (牛 岭) Mountain, the mass of which also forms the natural border of the county with the (originally) tropical rain forest of the interior of Hainan Island. At Lingshui Town the river widens considerably, thus forming a convenient natural harbor with the river leading as a wide canal eastward towards the coastline. Although the river is only some 50 meters wide at the point where it breaches the beach and merges with the South China Sea, it serves as the Harbor for many fishing vessels origination from the small towns found along the river. The river mouth is therefor also known a Shuikou Port, although there is not real harbor but only a river and a beach. Thus, the western interior and also the north of the county are hilly and forested, whereas a small flat strip of coastal land exists on the east side of the county. Lingshui lies near the coast and the county is limited in the south by Lingshui Bay, which has tow fairly large inland lakes which lie to the east and north of it. The largest of these inland lakes reaches some 6.5 kilometers northward and inland which is about half the way between Xincun Harbor and the center of Lingshui Town (which is another 6.8 kilometers roughly). A road between Lingshui and the coast runs to the north of the Xincun (Harbor) inland lake and since 2013 leads past a large seaquarium and entertainment park. Although not originally counted as a main destination to be on the island of Hainan, Lingshui and its County have always been popular as day trip or stay over destination for those who would like to go beyond the main city of Sanya (or Haikou) and explore th island and some of the original cultural traits it has to offer. Many tourist may have heard of Lingshui County as the location of one of the most popular tourist attractions of old on Hainan, this being the offshore Monkey Island populated with naughty macaques. Others may have heard of Lingshui due its Chinese Military Airbase where in the year 2001 a U.S. SIGINT plane made an emergency landing leading to some diplomatic struggles between the two nations. Most tourist and travelers however will seek out Lingshui County due to its Li Minority people, the clear blue skies, easy bicycling routes and stupendous views of cliffs, beaches and the vast open ocean. Where there is an ocean, there is marine life and Lingshui County has plenty of that to offer. Even today not as developed as Sanya City and its nearby Yalong Bay and Haitang Bay Resort towns, Lingshui and its Li Minority people still retain more of the original nature of the Island. Check out the various large harbors and smaller ports. Among the attractions found at Xincun Harbor is the Hailin Pearl Cultivation Farm, an old but still very popular tourist attraction of Lingshui County. Mind you, pearl diving was one of the main pillars of an otherwise quite impoverished local economy. Today, although tourism and trade are now thriving the Hailing Pearl Farm represents and preserves some of the ancient culture of the island. Since, there are as yet not too many official tourist attractions in Lingshui County, take a pick of the South Bay (Nan Wan), Hailing Pearl Farm and the nearby Nanwan Houdao Ecological Zone, or travel up all the way to the northern sea border of Lingshui County to visit Boundary Island. As its name suggests, the Island is considered to sit exactly on the border between Lingshui Li Autonomous County and Wanning County-Level City further up north. and their culture. Entirely new venues are in the making and by now Lingshui County should be the location of the largest sea world theme park in Asia entire. This Park annex Seaquarium will be named Lingshui Li'An Harbor Ocean Theme Park and it should already be operational. However, to this date it is not properly marked on tourist maps or on Google Maps. The theme park can be found along the road down from Lingshui Town to Li'An Port Town and lies at the top of the inland lake identified as Li'An port. Apart from the Lingshui Military Airbase which you should not go out and explore with camera's, the other important infrastructural element in Lingshui is the Lingshui Train Station. The Lingshui Train Station is a relatively new station which is part of the Hainan Eastern Ring High-Speed Railway. 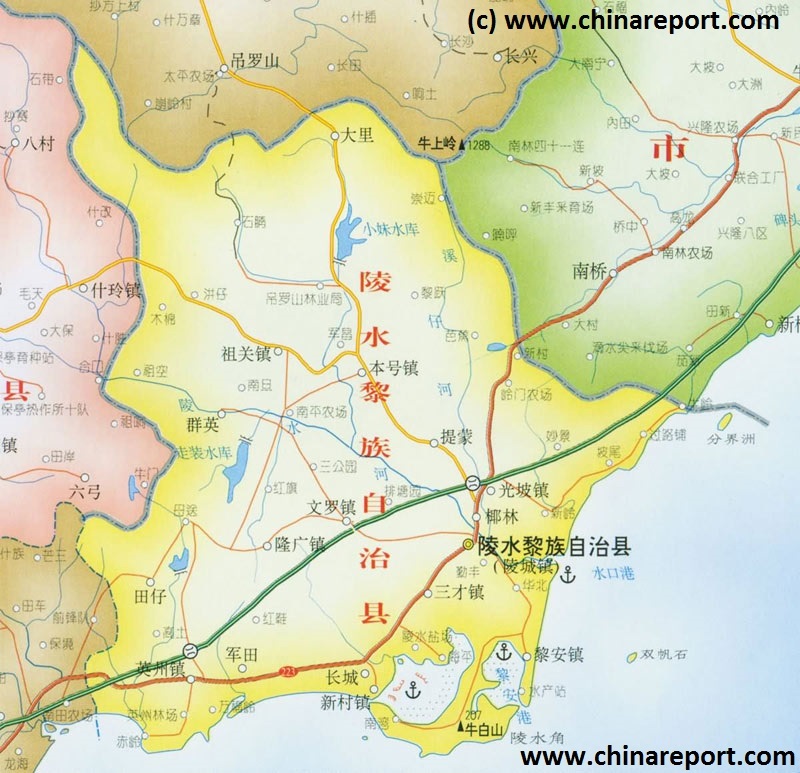 Crucially for travelers, this fast railroad connects Haikou in the north with Sanya in the south, along the way passing the main county towns, airports and tourist resorts of importance. Hence, traveling to Lingshui has never been more easy. Simply travel there and prepare to settle for a while in the country-side away from it all. Passers-through can always escape easily either by train or by car, heading to the next worthwhile scenic destination. Please refer to below text for more information on transportation in Lingshui Li Autonomous County or refer to: "Transportation in Hainan Island Province". Population; 318,691 in 1999. In the year 2000 there were 324,100 inhabitans, including Li of the total population of 54.3 percent. According to Lingshui County Government sources by 2004 Lingshui County counted 334,614 people of which interestingly 73,495 people were registered as members of the non-agricultural population and 56.3% were members of the Li Nationality (which is unique to Hainan Island). Since, the population has risen considerably with added migrants from the overcrowded and polluted mainland. Other expansions of the local population are brought by (over-) development in the Tourism Industry, with specifically in the last 2 to 3 years a row of resorts arising along Lingshui Bay due west of Xincun Harbor Town. In the official census these area's are however exempt, in other words they are not counted in the population census. This Google supported Satellite Map provides a clear overview of Hainan Island Province of the Peoples Republic of China, including its South China Sea Prefecture. Map of the South China Sea further includes parts of Taiwan and coastline, Gulf of Tonkin, coastline of Vietnam, Brunei, Borneo (Malaysia), and western Philippines. 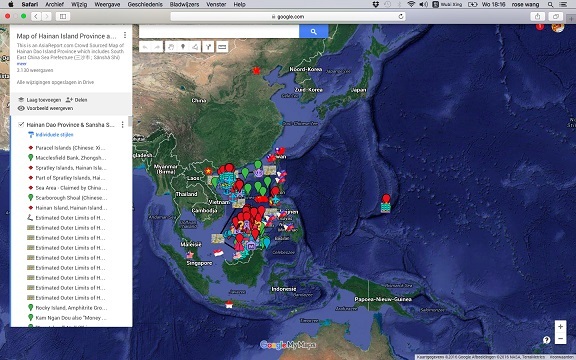 Marked on the map for orientation are the names of major National Capitals, locally relevant cities, several towns and villages, names of oceans, islands in the South China Sea, as well as locations of interest such as naval bases, artificial islands, airfields, tourism locations, etc. A Full and complete Map of China (PRC) identifying all Language Areas big and small in all Provinces and Autonomous Regions of China. In April 2016 the first measures were taken by the Central Government to stem over-development of real estate in all of Hainan Province also effecting the seemingly ever expanding luxury resorts advancing from the south on Lingshui Town and its best scenic beaches and land areas. It is currently to early to tell if such measures will have any effect on the management and local officials who cooperate to drive the lucrative real estate investment market mostly for short term personal gain. or refer to ′History of Hainan Province′. Hainan island Rim Highway and 223 state road both pass Lingshui County. Lingshui County is just 72 kilometers from Sanya Phoenix International Airport and it has highway connected to Sanya City. So the traffic is very convenient. The main river in the county is the Lingshui County which flows from the interior of the Island towards the coast along the way passing Lingshui Town. Apart from this main geographic features south of Lingshui are two large inland lakes which serve as natural habors as well as fisheries. The natural harbors of Lingshui County are Xincun Port, Li’an Port, Shanzhong Port, Shuikou Port and Gangpo Port. Xincun Port is the largest port with a water area of 33,390 acres (intertidal zone); an area of 18,537 acres are available. Overview Map of Lingshui Li Autonomous County (2016) and parts of adjacent territories highlighting the main geographical features of especially the coatsline. With the interior hilly, forested, tropical and devout of infrastucture or tourist attractions most holiday makers remain near the beach and coast of Lingshui Bay in the south. - Click Map image to go to Full Version. In the extreme south of Lingshui County, along the clear water bay part of the larger Lingshui Bay, an entirely new cluster of resorts has opened, again including a marina and a gold course. The new town has been named Yingzhou, after the local village of old but consists mainly of the Qingshuiwan Holiday Resort with all its separate components for entertainment and leisure. As an illustration of its popularity among youthful travelers on the mainland, in 2016 Lingshui County became the selected location for the Hainan International Youth Festival (2016), which was the first ever outdoor party event for expats in mainland China and on Hainan Island. It was a smashing success with an enthusiastic crowd attending events such as the nearly obligatory full moon party and a beach bikini color run along the lengthy beach of Lingshui Bay. In other words, by now in 2017 Lingshui County is an established name among the luxury resorts available on Hainan Island, and it is said that Lingshui is the best place to be to rest and recuperate while other parts of the Island are more known for sightseeing and catching snippets of the (former) natural wonders and glory of the tropical island. As one may find, most people come to Hainan for the beaches not the museums and any possible history, therefor Lingshui might now be the most popular place to book a stay on Hainan Island. Of the original landscape just inland from the beach nothing remains and west of Xin Cun Fishing Port the beach front is lined with various apartment flats, varying in luxury level and architectural tastes. Altogether the beach front it is a pretty fancy place. The number two historic tourist site of the county identified as Wanningwantou Islamic Cemetery at Lingshui Bay Beach however has been surrounded by resort apartment towers and seemingly swollen up by them. few recorded memories remain. To most it does not matter or not too much. What matters most is that the future has just arrived. YouTube Video: Spectacular Preview of Hainan Ocean Theme Park at Li An Port in Lingshui Li Autonomous County of Hainan Island. in this most coveted pieces of real estate on Hainan Island, if and when you make a stay in Lingshui County so be sure to hop on over and try one of spectacular mechanical and show feats that are presented. Apparently plain spotters like to take to the heights in the mountains in the north of Lingshui County which supposedly gives a good view of large military planes and jet fighters flying in- and out of Lingshui County Military Airbase (PLAAF). Lingshui (Yelin District), Xincun Town and Port, Yingzhou Resort Town, Li'An Port.